After any judgment, Jia Xu can discard a hand card to make that person redo the judgment. Jia Xu can skip his drawing and playing phases. This then clears all of his equipment. He flips the top card of the deck and can immediately use it. Jia Xu keeps using the top card until he cannot or does not want to use it. Jia Xu uses "Strange Ploy" in his turn for judgment tinkering. If he does, the person does a new judgment and the process starts over. This allows Jia Xu to use this power as often as he would like for a single judgment. "Military Chaos" is similar to a version of Lu Xun's "Linked Camps". Jia Xu does not have to use a card in "Military Chaos". He can decide to not use it, but then his turn ends. If Jia Xu draws equipment in "Military Chaos", he is allowed to use it. He can even use it if it replaces other equipment that he had already acquired that turn. 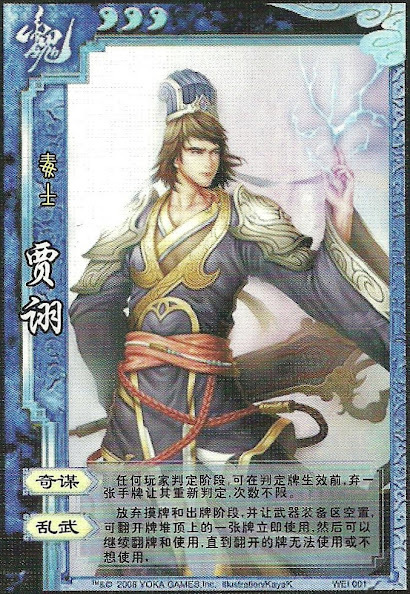 Unlike Lu Xun, Jia Xu does not get to keep the last card from "Military Chaos". It is discarded and Jia Xu enters his discard phase.